The bacon crisis is being made worse by all those panic buyers, who are afraid that there will be no bacon next year. 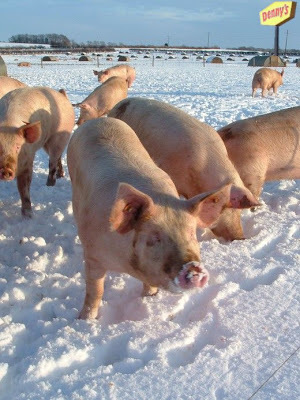 "The media have, as usual, exaggerated this shortage to crisis proportions," said Chester White, spokesperson for the Midwest Pig Farmers Association, "We merely stated that in the Midwest, pigs marked for the food industry were down by about 40% this year, and that we would have to take steps to bridge this shortfall. There are other areas in the United States which have had bumper pig seasons and across the board 'food pigs' are only down by about 10%. However, there will be a cost increase for ham, bacon and other pork products." Bacon is by far the most popular and exciting pork product around and can be found pretty much everywhere except maybe in a synagogue. People have discovered the joy of chocolate chip and bacon cookies, bacon wrapped weenies and even bacon flavored vodka. Many state fairs have some kind of bacon on a stick delicacy, but my favorite is bacon wrapped chocolate on a stick, dipped in chocolate. I apologize to those of you who were looking for an article on Kevin Bacon and the fact that he is somehow inter-related to every single actor/actress in 6 steps or less. For example, he is related to actress Kyra Sedgwick in a couple of ways. A bacon shortage? Now that's what I would call a real crisis! As for my favorite recipe? No need. I like bacon best served up in sizzlin' strips!